An extremely important part of the operation of a helicopter in combat is communications. The ability to communicate between crew members within the helicopter is absolutely required. Equally required is the ability to talk outside the helicopter to other helicopters, ground combat forces and air traffic control. These absolute requirements make the Signal Detachment an essential part of the overall team within the assault helicopter company. Very important too is navigation equipment that must be functional and, of course, encryption equipment which arrived in Vietnam during the 1964-65 time period. 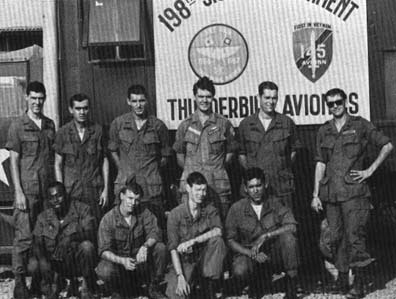 The T O & E of the 33rd Transportation Company, the 118th Aviation Company (AML) and finally the 118th Assault Helicopter Company all included the 198th Signal Detachment. While the size of the 198th Signal Detachment was small, it was as important as any other Detachment. detachment commander LT. Al Croteau.